The Rev. Karl W. Runser III began serving as Pastor of the Southern Clinton County Lutheran Parish at the beginning of January. Pastor Runser grew up in Athens County, Ohio, and graduated from Ohio University with a degree in Music History and Literature. 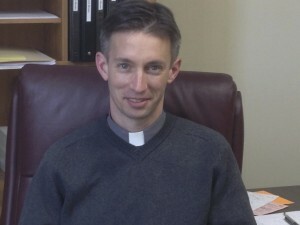 He received his Master of Divinity from the Lutheran Theological Seminary at Gettysburg and was ordained in 2002. From 2002 to 2012, Pastor Runser served the Galeton Shared Ministry, an ecumenical two-point parish in eastern Potter County, Pennsylvania. Additionally, Pastor Runser has served on the councils of the Northwestern Pennsylvania Synod and the Northumberland Presbytery, as well as the Policy Council of Lutheran Advocacy Ministry in Pennsylvania, the ELCA’s state public policy office in Harrisburg. In his spare time Pastor Runser enjoys fly fishing, cross-country skiing, cooking, and movies. He makes stained glass pieces, mostly of the small variety. With the encouragement of his wife Sharon, he’s learning to ride horses.